NEW Bigger Size! 40cm tall, 30cm wide and 40mm deep - a really nice size for any room. Pure cotton canvas hand stretched onto high quality solid wooden frame from eco source. Professional tape finish on back - no staples visible - complete with hanger. Artwork printed using 200 year + museum quality vivid ink system and finished with protective matt coating for lasting good looks. Regular : 34cm wide, 44cm high, 21mm deep - without mount. Large : 44cm wide, 54cm high, 21mm deep - complete with acid free Ivory mount. 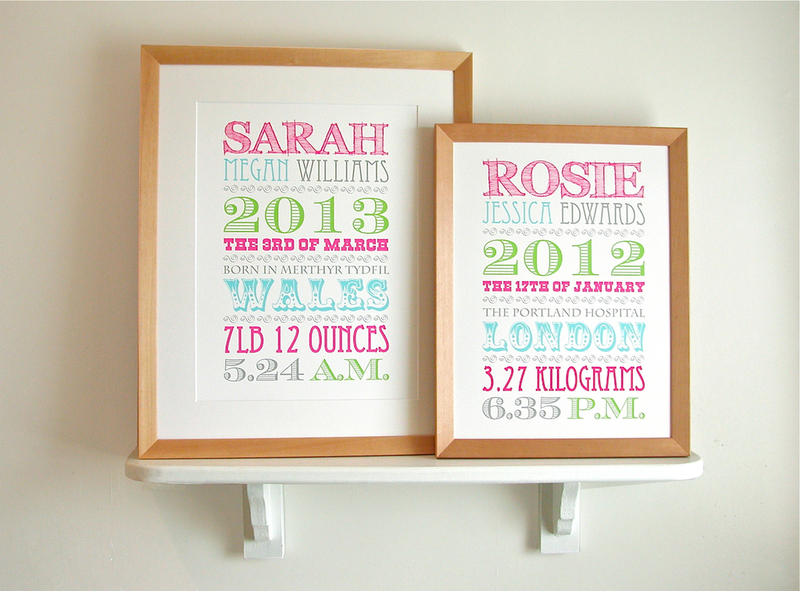 These are beautiful quality solid wood frames specially made for us by Nielsen Bainbridge. In Birch wood or off White finish, complete with child safe Perspex glazing. Image area approx 25cm x 35cm. Overall paper size A3+ 33 x 48cm. Supplied rolled in tissue paper and posted in sturdy cardboard poster tube. This is a very high quality Fine Art Print on thick 308gsm Hahnemühle fine art stock. The print is designed to be mounted and framed - for best results we STRONGLY RECOMMEND OUR FRAMING OPTION, as described above. Framing by high street framers is expensive! Our mounts and frames are great value and fantastic quality. This is not a "poster" and is NOT suitable for blue tack! We'll send you an e-mail proof, within 7 working days, so you can check everything's perfect. Then allow up to 7 working days from your approval of artwork to despatch from us. This may vary in busy periods and we’ll advise you early if so. Allow 14 days Standard delivery. Choose Express for fastest proof & delivery! FREE Standard Delivery: Generally allow about 14 working working days for proofing process and despatch. If required by a certain date please let us know in special instructions or by calling and we’ll try hard to help. Europe: Canvas £15. Framed £25. Print in Tube £12. Rest of the World: Canvas £20. Framed £30. Print in Tube £15. We use various international "Signed For" services. Allow about 7 days from despatch date to arrive in Country. We will email you the tracking reference when your order is despatched. Be aware in some countries local delivery may be delayed due to Customs procedures - we will track and help wherever we can. Sometimes local Taxes or Duty may have to be paid - this varies by Country and is very unpredictable - please be aware responsibility for payment of any additional duty/tax is repsonsibility of the purchaser. 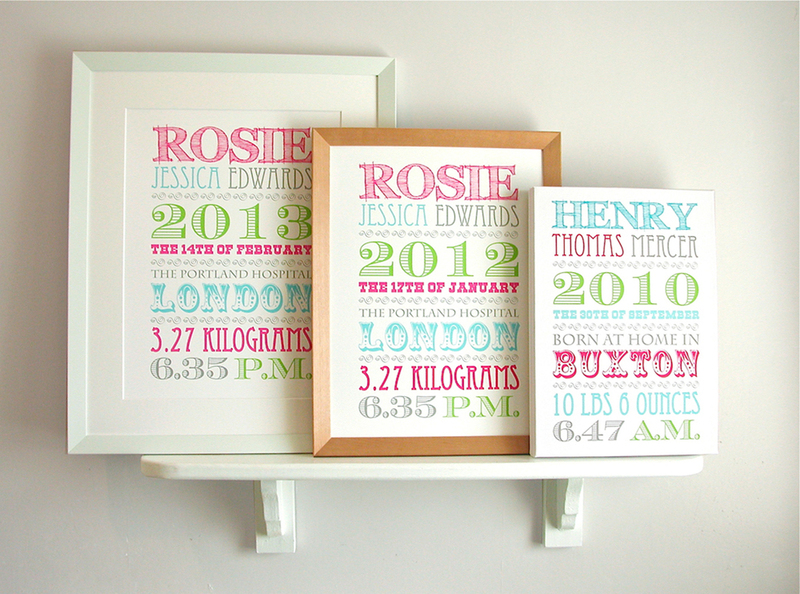 A super stylish way to celebrate special arrivals with our Vintage feel typographic artwork. 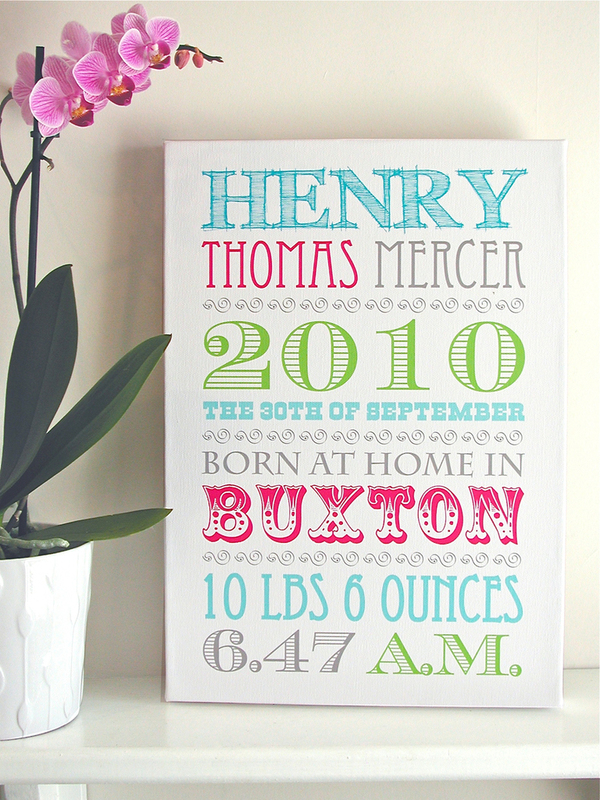 Fresh bright colours and the coolest typography. For boys, the first name is usually in Blue. For girls, the first name is in Magenta. Then we use the colour combinations as shown in our photo examples. If you have a boy and want his first name in Magenta just check the "girl - magenta" button. If you want your girl in Blue, check the "boy - blue" button. Remeber we'll send you a proof anyway so you'll get the chance to double check. You can add an additional line if required e.g. 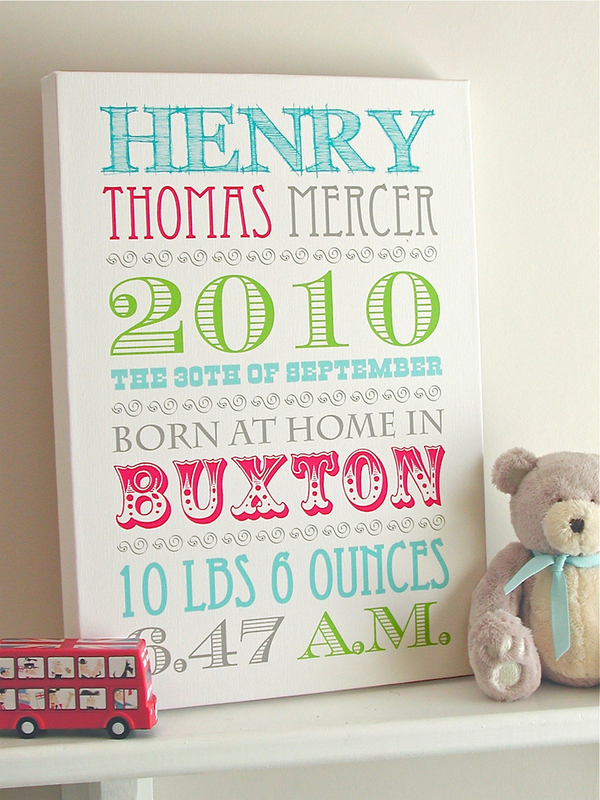 "Born at Poole Hospital", "Welcome to the world little one" - your own words! You'll notice from the pictures that the words get smaller the more of them there are. So bear in mind, fewer words are bigger and more words are smaller. "So glad I came across this site. Absolutely love the canvas we had for our daughters room. Amazed! Straight onto the wall within minutes of recieving it! Very, very impressed. Would most definately use this site again, and recommend to anyone. " "Just wanted you to know I've received Jacob's Typographic artwork yesterday and I'm truly over the moon. Its even nicer than I could've imagined and completes by little boys nursery. I'm really really made up! Choose Express for fastest proof & delivery! 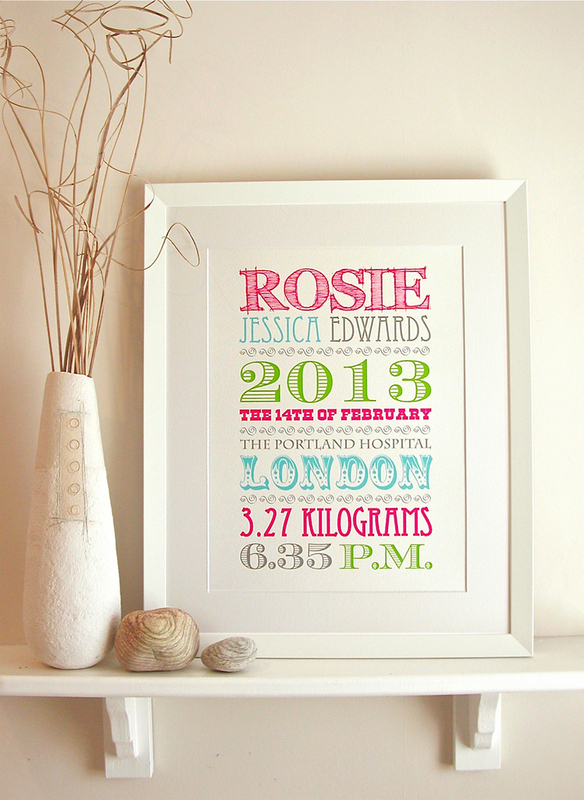 A super stylish way to celebrate special arrivals with our Vintage feel typographic artwork. Great for older kids too! With fresh bright colours and the coolest typography, these will look amazing for years to come. And you'll never forget those important dates, times and weights! Boys, first name in Blue. Girls, first name in Magenta. Then colourways as per pictures shown. Flexible additional line if required e.g. Born at Poole Hospital, Welcome to the world little one - your words! Canvas: NEW Bigger Size! 30cm x 40cm x 40mm deep. Regular Frame: 34cm x 44cm x 21mm deep - without mount. Large Frame: 44cm x 54cm x 21mm deep - with Ivory mount. We'll send you an e-mail proof, within 7 working days, so you can check everything's perfect. Then allow up to 7 working days from your approval of artwork to despatch from us. Click our Specification, Delivery and Design Note tabs for the finer details - above the pictures on the left.